Some mornings last year I would watch Frasier or Charmed on channel 11 if I didn’t have a lecture to go to. Before that, if I was up early enough, Alive and Cooking would be on. 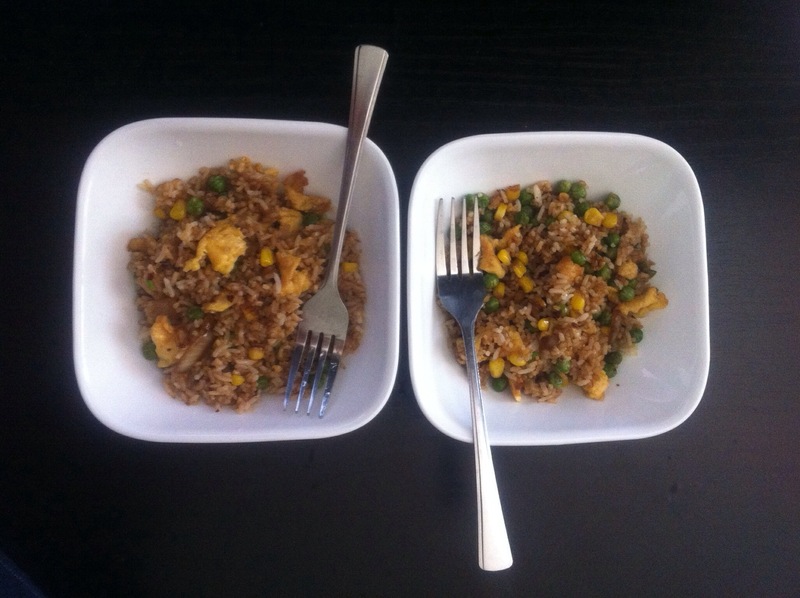 This fried rice recipe is adapted from one I saw James Reeson prepare. He kept talking about how simple and easy it was to make. I think it’s only simple and easy when you have all the ingredients and also your kitchen is not in a state of disarray. I just checked the Alive and Cooking website, and it has been re-vamped a lot in the past year and a half. I read an interesting biography of James. If you want to check it out it is here. If you share/re-post any of my photos please link this post to credit me. Meat and/or vegetables of your choice if you wish to include them. 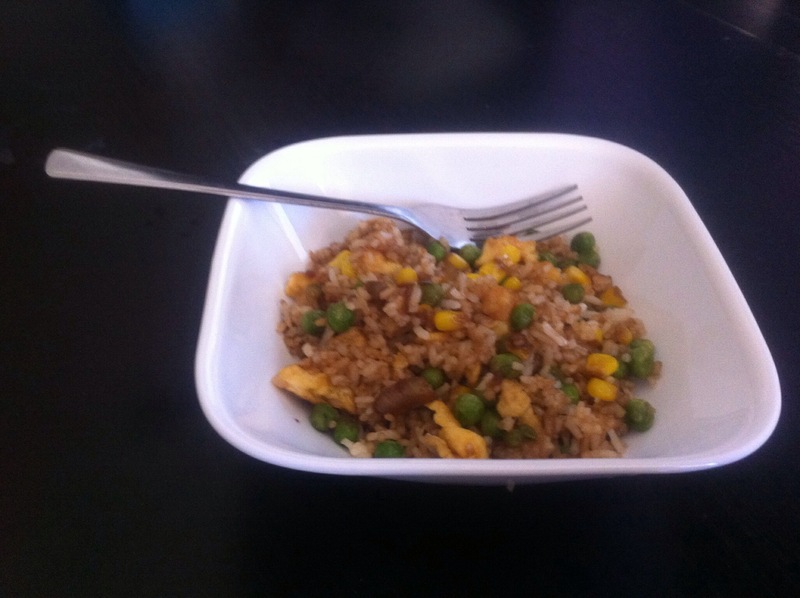 I used corn, peas and onion. Add beaten egg and swirl around after 20 seconds with a wooden spoon. Keep moving it around the pan, so it is cooked through evenly. Remove from pan to a bowl or plate. Add the other tablespoon of sesame oil to the frypan and return to the heat. If you are going to add meat or seafood now is the time to do it. Stir fry everything for 5 – 7 minutes, till the meats are cooked through. Toss in the chopped onion and stir fry for a minute before adding your other vegetables. Add the ginger and garlic paste and mix it all around the pan. Add the rice and swirl around the wooden spoon to break up any lumps and coat all the rice in the oil. Put in all the soy sauce and Worcestershire sauce. Keep stirring and check if the saltiness is right. Return the fried egg to the pan and mix everything through. Season if you need to and add chili flakes if you want to. You can use fresh garlic or ginger instead of the salty paste variety. Or you can omit those ingredients. Fish or oyster sauce can be used instead of Worcestershire sauce. Fresh chili will add a nice zing to the flavour as will chili powder. Fry or steam some spring rolls if you have any in the freezer! 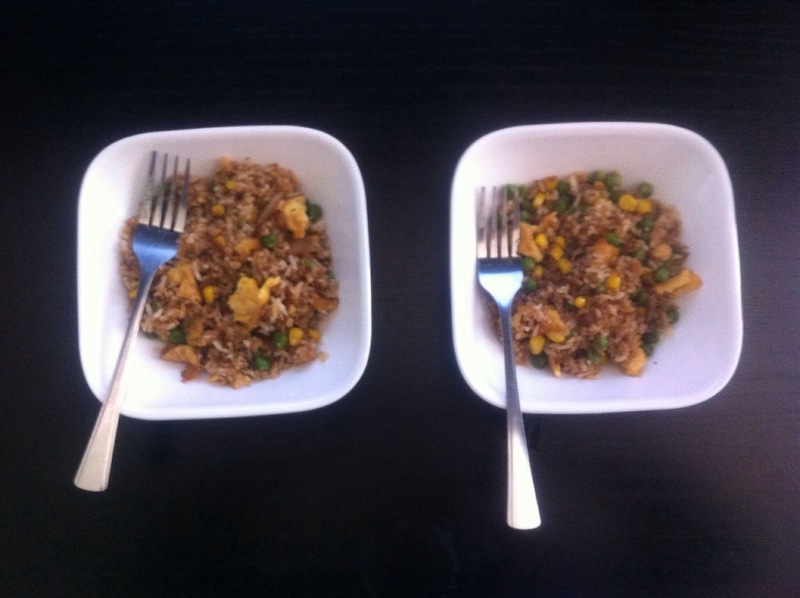 They complement fried rice well and extend the meal. 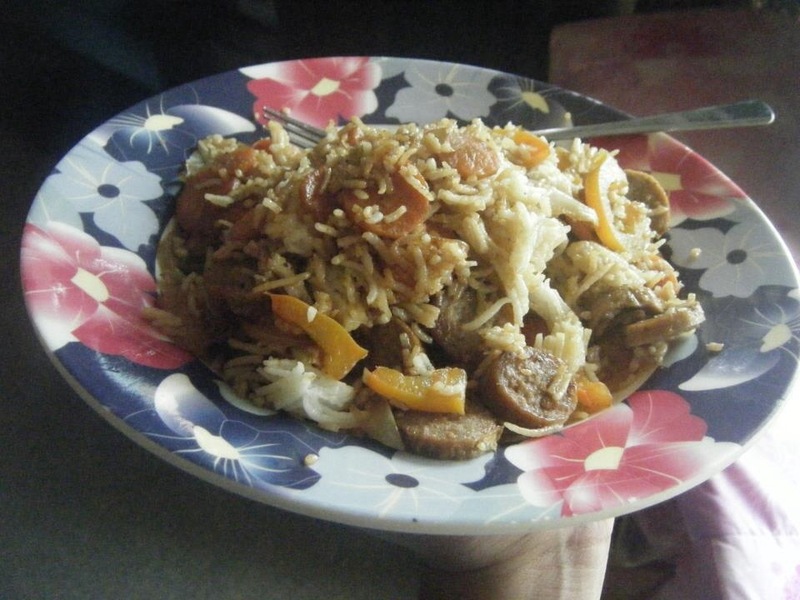 I once made this recipe with carrot slices and chicken sausage slices so be inventive with your ingredients too (there’s a photo at the end) . A lot of stuff will taste great fried up with the sauces and pastes. The photos show two small serves (Anan and I ate) but it could be one regular sized serve. Consider how much of each ingredient will be suitable for you. Previous Post Orange vanilla smoothie.